You may have heard that we have been experiencing a rather cold late winter this year. Even people like me who don't normally wear gloves has taken to wearing one. Unfortunately due to the explosion of smartphones with capacitive touchscreens, using one with gloves is nigh impossible. Enter The North Face E-Tip gloves. The E-Tip isn't particularly unique. I have seen several gloves using similar conductive material fabrics designed to be used with touchscreen devices. 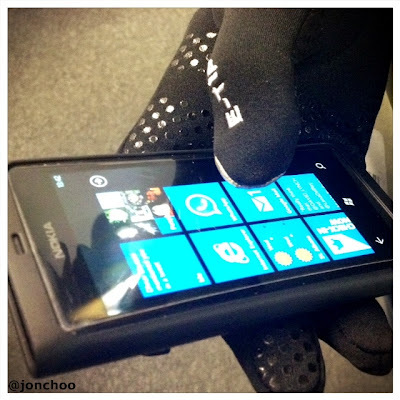 You can even turn your existing gloves into one that can be used with your phone. The conductive material used by The North Face is a type of fibre called X-Static, which contains a layer of silver which helps prevent the growth of bacteria and regulate temperature. Naturally, it also allows you to touch the display of a smartphone on both thumb and index fingers. The nice thing about these E-Tip gloves are the additions of silicon grip pattern on the palm side of the gloves, aiding you in gripping whatever device you are holding. There is also a useful small clip that allows you to attach the two gloves together when not in used. The gloves themselves aren't attractive, but at least they are comfortable and provide a level of warmth for urban use. As with all gloves of this kind, accuracy takes a hit meaning don't expect to be able to type as quick as you normally would without a pair of gloves. It is still accurate enough for general use, but expect plenty of trial and error. Learn to trust your smartphone's auto correct and you will still be able to jot down a quick message easily in between snowman building sessions. At £30, these gloves aren't cheap but they do provide you with enough warmth and some degree of freedom to use your phone in the cold. I got mine from Snow+Rock, but you can find them in almost any good outdoor kit stores, and even Amazon. There are versions for both male and female, as well as a more expensive called the E-Tip Pamir with GORE Windstopper fabric.